The wait gave Latonya Drumwright a premonition. It was supposed to be a quick visit, something she could get done during her lunch hour on a beautiful March day when the daffodils seemed brighter than sunshine. Now she sat under the glare of a fluorescent light with the uneasy inkling that this mammogram would not be just another routine checkup. She took the rest of the day off from work to tell her husband, whose mother had died from breast cancer, that she, too, might have the disease. Breast cancer is deadlier for African-American women, who have a survival rate of only 68 percent five years after diagnosis and treatment compared to 83 percent for white women, according to a 2015 study published in JAMA Oncology. The disparity in outcomes is well documented, but the reasons for it aren’t understood. Researchers at Vanderbilt-Ingram Cancer Center (VICC) are looking for answers in the largest-ever study of breast cancer genetics in black women. 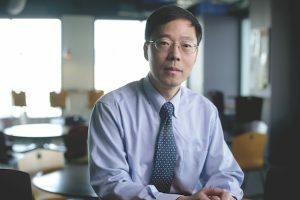 Wei Zheng, M.D., Ph.D., is the lead principal investigator of the $12 million Breast Cancer Genetic Study in African-Ancestry Populations initiative funded by the National Cancer Institute (NCI). While many factors can figure into African-American health disparities—access to care, environmental stressors, diet—the genetic factor is one with scarce scientific inquiry. This study will use a genomic approach in an attempt to identify genetic risk factors. Zheng, working with colleagues at VICC and Meharry Medical College, along with co-principal investigators at the University of Southern California and Boston University, as well as researchers at other institutions, will study samples collected from tens of thousands of women, sharing biospecimens and data from 18 previous studies. The genome—the complete set of DNA, which encompasses more than 3 billion parts—of women who have donated biospecimens to those studies will be interrogated. The genomes of 20,000 black women with breast cancer will be compared with those of 20,000 black women without breast cancer. They will also be compared to those of white women with breast cancer to identify genetic variations associated with risk. The study does not stop with genetic risk factors. It will also examine gene expression in tumor samples to investigate the pathways for tumor development. A primary reason for the focus on genetic factors is African-American women are prone to be diagnosed with more aggressive forms of breast cancer, particularly triple-negative breast cancer, which has none of the three receptors that would make it respond to hormone or targeted therapies. The rate of triple-negative breast cancer is twice as high in black women as in white women. Treatments for triple-negative breast cancer are usually limited to chemotherapy and surgery. Drumwright’s biopsy in 2014 confirmed she had breast cancer. That was the bad news. The good news was that her tumor was HER-2 positive, ER positive and PR positive. It had all three receptors that could help her tumor respond to hormone or targeted therapies. But that didn’t mean she could forgo surgery, chemotherapy and radiation. She underwent those treatments and also took a targeted therapy. 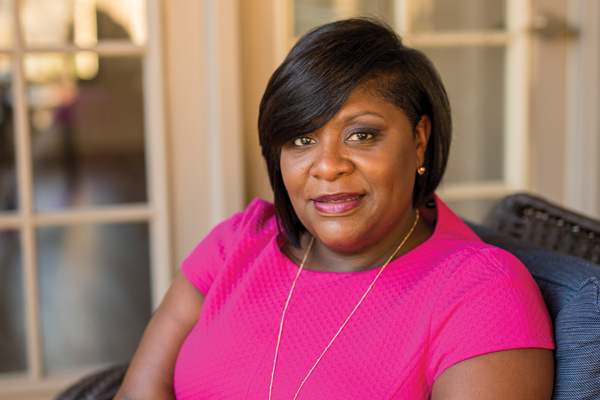 Drumwright was fortunate to have a strong support system said Andrea A. Birch, M.D., who treated her at the Vanderbilt Breast Center. Birch, associate professor of Clinical Radiology and Radiological Sciences, worked previously at a hospital in Memphis, a city with a majority black population and a high poverty rate. People from Mississippi and Arkansas were also treated at the hospital. They faced barriers to care on many fronts: limited transportation options, unfamiliarity with medical terms, insufficient internet access to become better informed about their disease and treatment, and inadequate support from their employers as well as family members hamstrung by paltry paid time-off policies. Few had health insurance, and participating in mammographic breast cancer screening was considered a luxury, she said. Even though she witnessed firsthand other factors that contribute to the disparity in breast cancer death rates between blacks and whites, Birch welcomes a $12 million study primarily focused on genetics. Minority students from various institutions, including Meharry Medical College, a historically black academic health science center in Nashville, will play an important role in the study, the NCI said in announcing the $12 million grant. The grant will also provide training opportunities for scientists from minority populations. While the Breast Cancer Genetic Study in African-Ancestry Populations is not specifically aimed at developing treatments for aggressive forms of breast cancer, such as triple-negative, it could identify genetic pathways toward the development of new drugs. 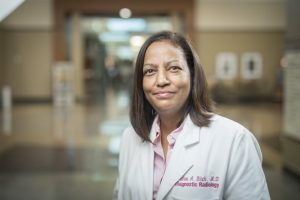 Tuya Pal, M.D., associate director of Cancer Health Disparities at VICC and Ingram Professor of Cancer Research, said it is vital that genetic risk factors for breast cancer in African-Americans be better understood. Geneticists and epidemiologists interested in researching cancer causes among African-Americans have been limited in the past due to the paucity of databases and lack of open access to the few that existed, said Shaneda Warren Andersen, Ph.D., a Vanderbilt researcher and instructor. “I did my dissertation research on breast cancer, but the study data I was using was in white women,” she said. The National Institutes of Health has since enacted policies to make genetic data publicly available to qualified researchers. “When I conducted my dissertation, there were few epidemiologic datasets available to conduct research on the genetics of breast cancer risk in African-American women,” Andersen said. Now that she has joined the Vanderbilt faculty, she is researching racial disparities and health outcomes related to colorectal cancer using data from the Southern Community Cohort Study. That study, a 15-year partnership between Vanderbilt and Meharry, and other studies like it form the foundation for The Breast Cancer Genetic Study in African-Ancestry Populations. William J. Blot, Ph.D., research professor of Medicine at Vanderbilt and chief executive officer of the International Epidemiology Institute in Rockville, Maryland, and Margaret K. Hargreaves, Ph.D., professor of Internal Medicine at Meharry Medical College, launched the Southern Community Cohort Study in 2002. It became the largest epidemiologic study to assess reasons for racial disparities with cancer. Zheng, who is a co-leader on that study, is also a principal investigator of the Nashville Breast Health Study and another study by the Meharry/Vanderbilt/TSU Cancer Partnership. Maureen Sanderson, Ph.D., professor of Family and Community Medicine at Meharry and an adjunct professor of Medicine at Vanderbilt, is working with Zheng on the latest initiative. Zheng said he believes that several factors may contribute to disparities in breast cancer outcomes. Almost 20 years ago, he had a scientific study published that investigated a possible link between the disease and diet—specifically the well-done meats that are part of Southern cuisine. (He’s also studied soy intake among Asians.) And he agrees that access to care—good quality care—and a strong support system are important determinants. Although this $12 million study focuses on African-Americans, all races could benefit from its findings. Triple-negative breast cancer and other aggressive forms of the disease affect people of all ethnicities. This study will go beyond past genetic inquiries, Zheng said, by studying genomic structural variation—differences in the chromosome that can comprise millions of nucleotides and have an effect on disease susceptibility. The Breast Cancer Genetic Study in African-Ancestry Populations does not require new recruits. Researchers will analyze biospecimens donated by participants in the prior studies, review answers to questionnaires they submitted and compare the data. Participants are masked to protect their identities. Birch is not one of the researchers. She’s a frontline clinician—one who has come to admire the resilience she’s witnessed in many African-American women, women who have dealt with multiple challenges in their lives to the point that the diagnosis becomes another unfortunate ball to juggle, she said. Drumwright kept working from April 2014, when her treatments started, until August 2014 when she had to take short-term leave that turned into a longer-term leave. All told, she underwent five surgeries and took a year off from work. When October 2014 came and “Pink Sunday” arrived at The Temple Church, where her husband, the Rev. Darrell Drumwright, is the pastor, she had to admit she didn’t have the strength to take part in an annual breast cancer walk that week. The congregation members gave her encouragement. The rate of triple-negative breast cancer is twice as high in black women as in white women. It is called triple-negative because cancer cells do not have estrogen receptors, progesterone receptors or large amounts of HER-2 protein. Birch saw Drumwright at one of those events among the hundreds of people wearing pink T-shirts. The Temple Church Health Ministry schedules free screenings for women by bringing a mobile mammography unit to the church.